2015 Jan, “A modern quest for subjective identity in teaching Medieval Literature,” presented at HIC International Conference on Education, California State University- Drexel University – Pepperdine University – University of Louisville, Hawaii. 2013 May, “Use of Technology for literature courses, why not?” Create a literary Webquest for your students. 2012 Oct, “Time Management: How to make it happen! PhD is about organization,” GTP, Bould er, CU. 2012 Sept, “How to Adapt to American & International Undergraduate Students and Enjoy Teaching at CU,” GTP, Boulder, CU. 2012 Apr, “Student Oriented Teaching, Commitment and limits,” SOCALLT, Colorado. 2011 Feb, “Teaching and learning Languages Should be fun!” GTP, Boulder, CU. 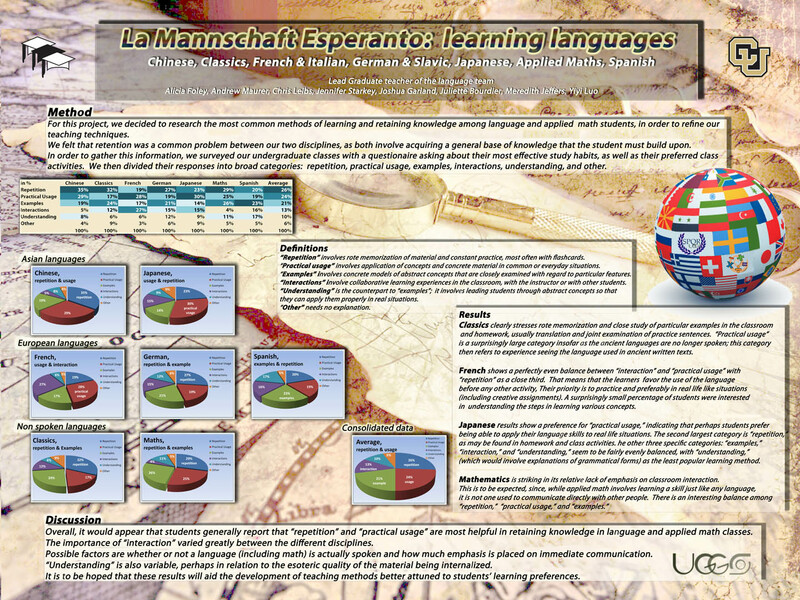 2011 Apr, “Learning Styles in Languages Acquisition,” Poster Event on Teaching, Boulder, CU. 2010 Feb, “Using Technologies in the Classroom, a tool not a constraint!” GTP, Boulder, CU. 2009 Aug, “How to deal with problems in the classroom,” GTP, Boulder, CU. 2009 Nov, “How to design a course using Ning,” GTP, Boulder, CU. 2009-2013, ALTEC Annual Share fair, CU Boulder. Presentations, Workshops on the use of Technologies in the classroom: use, students’ reaction and appreciation, efficiency on students learning abilities. 2009: “Voicethread, Make Students Listen to Each Other,” from creative writing to creative speaking. 2010 : “Ning, a Private Forum for Student’s Assignments,” make students own their own learning space. 2011: “Photostory, in Medieval Literature Apprehension,” I turned my students into story tellers. 2012: “Technologies, Ups and Downs, Not a Purpose But a Tool,” help students research online. 2013: “Use of Technology for literature courses, why not?” Create a literary Webquest for your students. .